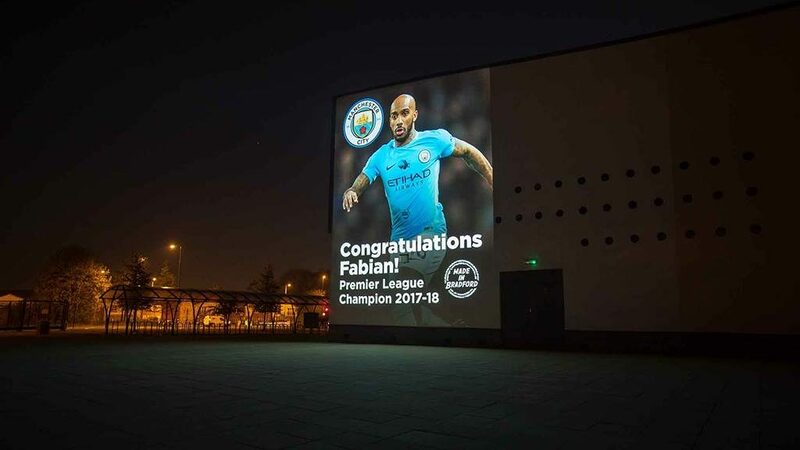 A 24 foot high projection of Manchester City midfielder Fabian Delph has served to remind Tong Leadership Academy pupils that they can achieve their goals if they work hard enough. As part of the end of season celebrations for Premier League champions Manchester City FC, our former pupil’s image was projected onto the school building. The resulting image, along with those of Delph’s teammates in other locations, was shared on social media on the morning of Monday 7 May as a surprise celebration for the Premiership players. Delph attend the then Tong School between 2001 and 2006. It’s here that Delph was given support and encouragement to follow his dreams to build a career around playing football. Sports engagement firm Beyond90, based in Manchester, has been working with Manchester City FC to stage the projections, each on a key location for members of the Premiership winning side. The large scale photography projections onto key buildings were carried out at twilight. The Beyond90 team travelled to 22 different locations across the world, including Portugal, the Ivory Coast and Argentina to capture images and video for every member of the squad. “We are proud to have Fabian Delph among our alumni. He is an inspirational role model for current Tong Leadership Academy pupils and a fine example of someone who worked hard at a sport he showed great promise in and, with nine England caps and a Premiership title to his name, achieved his goals. “What’s really pleasing is that it was Delph’s own family who chose Tong as a location from his formative years that has a strong emotional resonance for him. Clearly, they recognise how the support and learning Delph was offered there helped to shape him into the champion he is today. Fabian Delph signed for Bradford City FC at the age of 11, joining Leeds United FC in 2001 while a Tong School pupil. Five years later he made his debut first team appearance for the club, later having a two and a half year stint at Aston Villa FC before joining Manchester City FC in 2015.